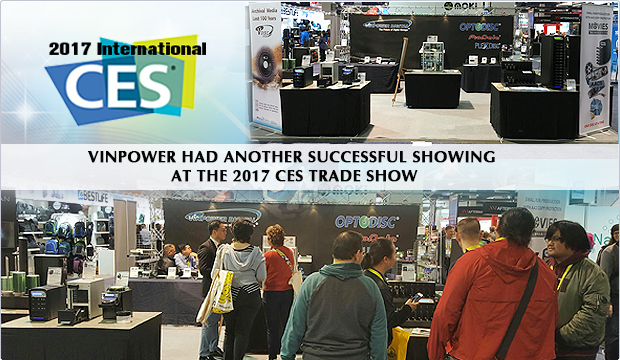 Thank you to everyone that visited our booth at the 2017 CES trade show. Once again, Vinpower received great feedback from the show floor and took a number of meetings with valued customers and vendors alike. This year, we introduced a number of new products and offering, like the upcoming secure flash drive, which can protect information stored on it from falling into the wrong hands. In addition, we introduced the upcoming official AACS Blu-ray Copy Protection through standalone duplicators and much more. â€¢ or any number of other exhibits we will attend throughout the year. For more details on any of the products exhibited at CES, or anything that Vinpower carries, please visit our website at www.vinpowerdigital.com, or speak with an official Vinpower representative near you.